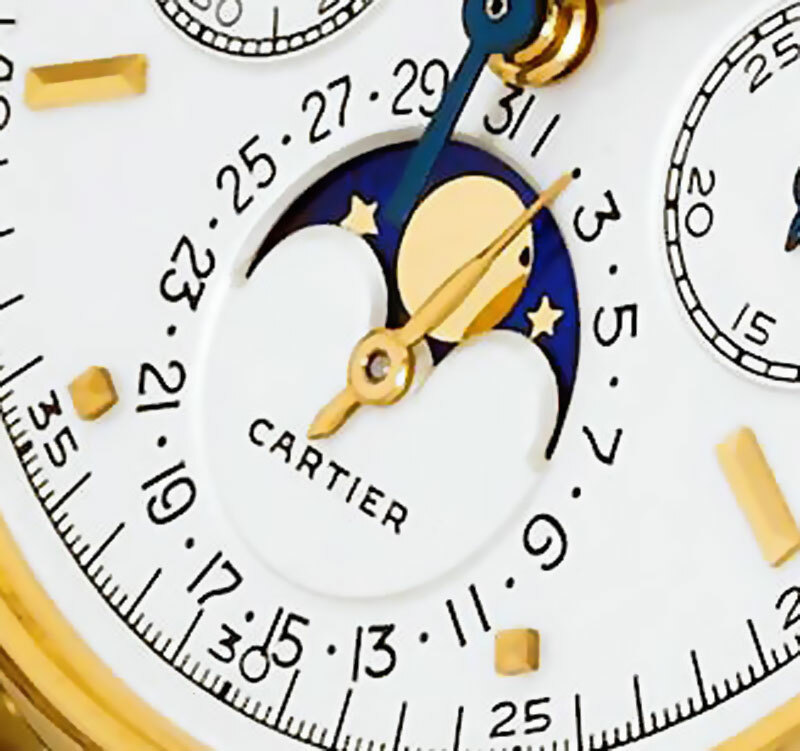 I am and have always been fascinated with Patek Philippe complicated Moonphase watches. 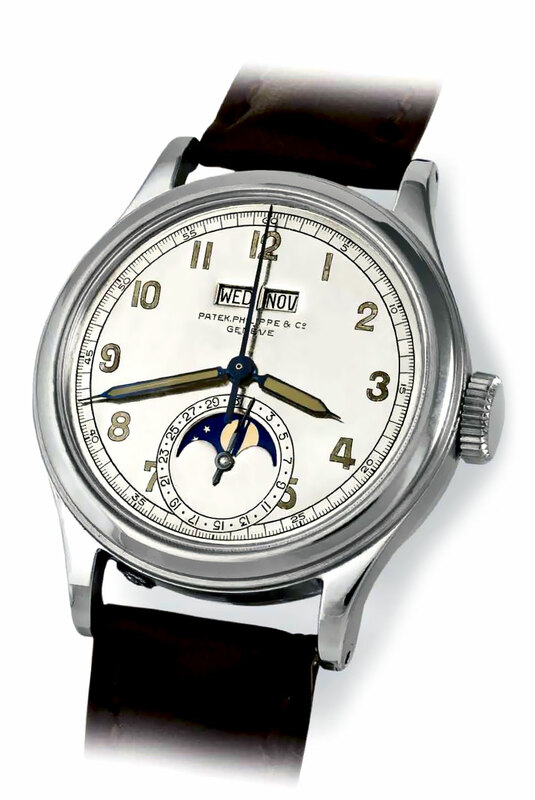 I have been researching the ethos of the Patek Philippe Moonphase wristwatches, and here is a very early model made in 1927, and it is an absolute beauty. 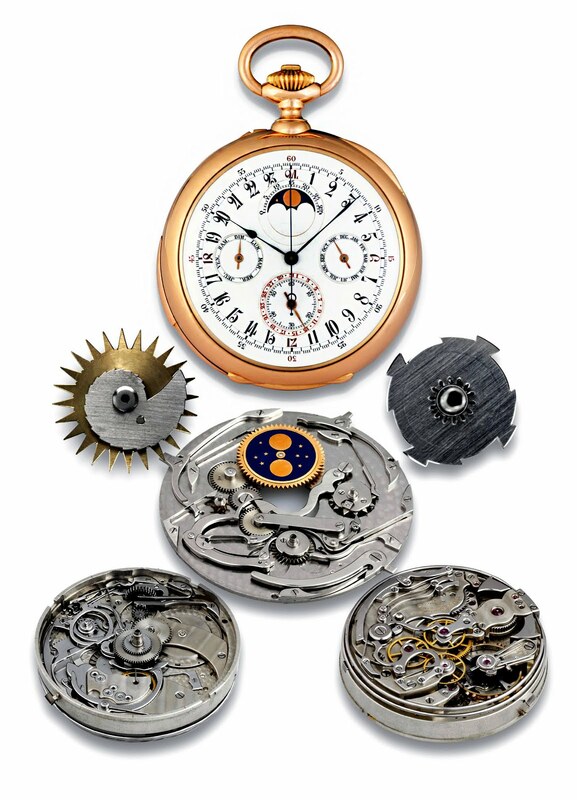 These early Moonphase watches were never produced in any kind of quantity and are extremely rare and valuable. 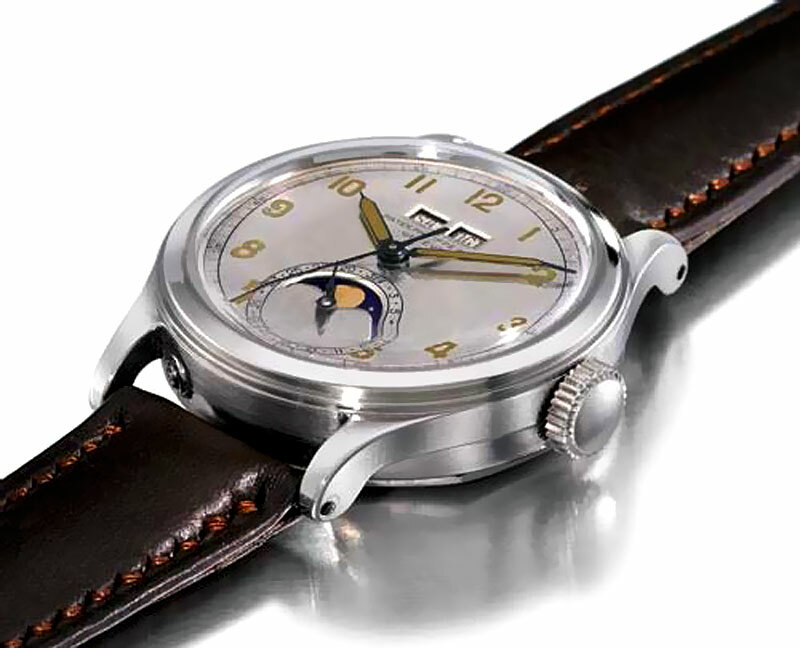 The early Patek Philippe Moonphase watches were styled as Avante-Garde, Art-Deco masterpieces. It is challenging to understand today just how innovative this watch was when it was made in the late 1920s. For instance, this is the first digital wristwatch I know of with digital day-of-the-week and month discs which are read through rectangular aperture windows. Antiquorum successfully auctioned this amazing complicated Patek Philippe pocket watch for $2.29 Million today. This 120 years old beauty was originally sold in 1894 for 3750 Swiss Francs. Notice there is no Patek Philippe designation on the dial. This watch his unusual in that it has a 24-hour train dial, meaning it keeps 24 hour GMT time, as opposed to the standard 12 hour time. 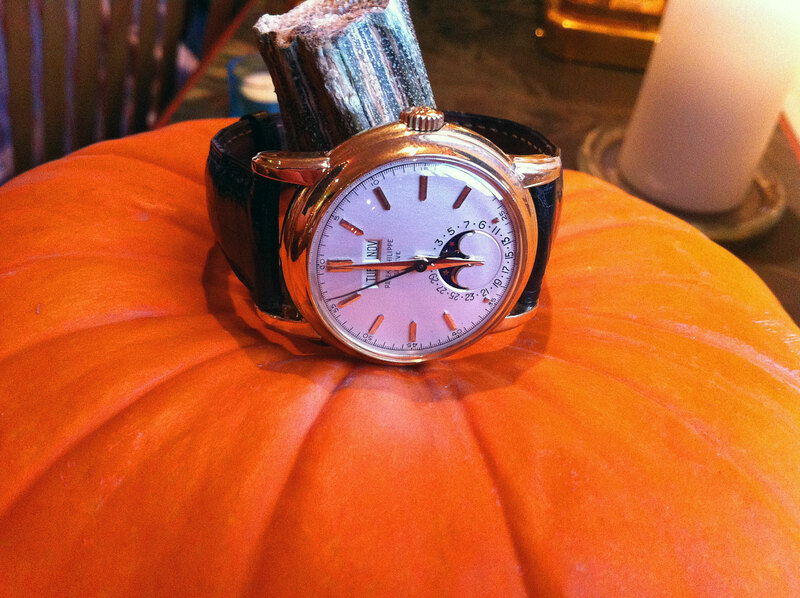 This is a very rare 1966 Patek Philippe Reference 2499 because it has the Cartier designation printed on the center of the moon phase sub dial. This watch was has the Cartier designation on the dial because it was originally retailed by Cartier. This watch was sold by Antiquorum Auction House in 2006 for $680,000. This is the ONLY known example of the Patek Philippe Reference 2499 to be produced with the Cartier designation on the dial. Antiquorum Auction House has successfully sold versions of this very rare Platinum Patek Philippe in the past. 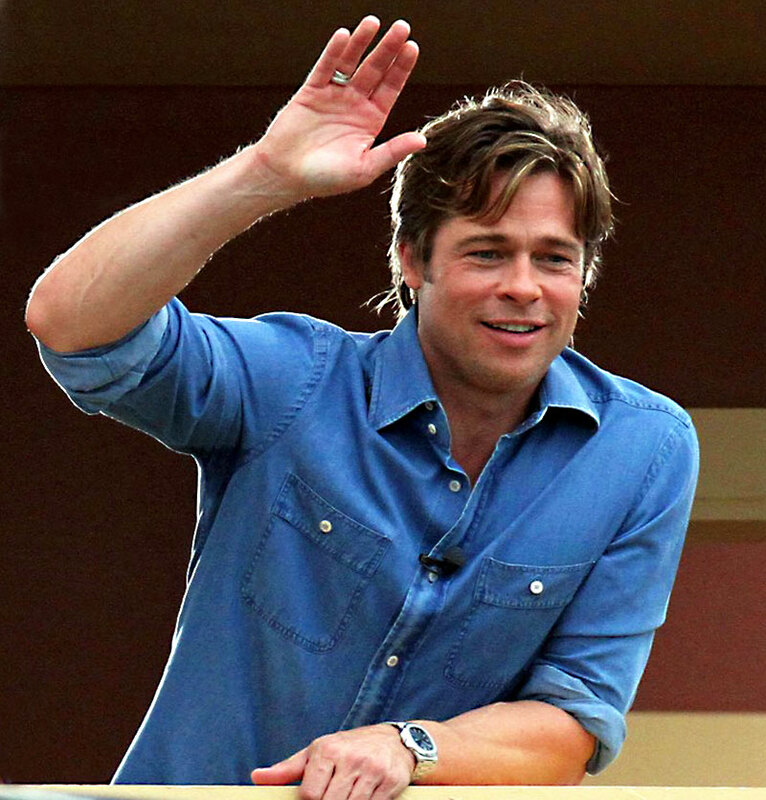 The one pictured below sold on July 12, 2006 for $117,400. The Reference 5125 is very rare in Platinum. 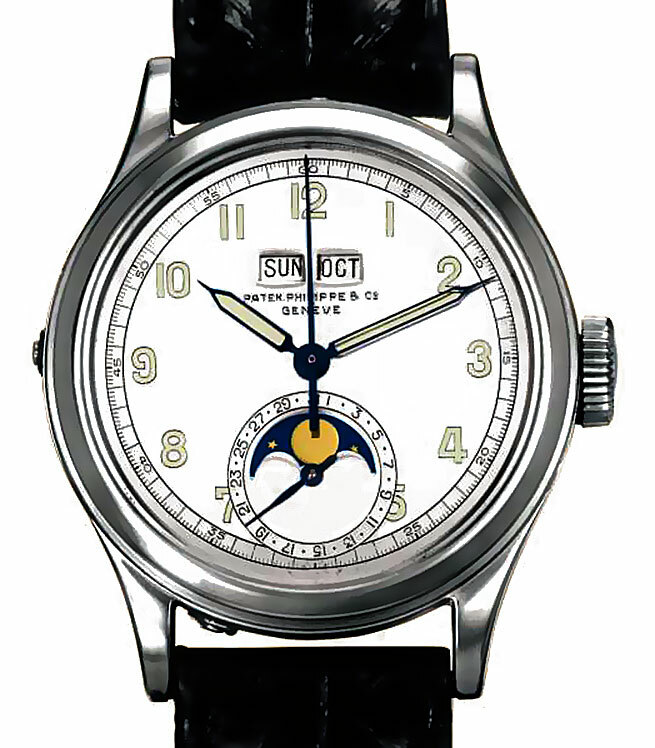 Notice the version of this Reference 5125P was the WEMPE Logo designation printed on the moon phase sub-dial, and the version later in this story lacks the WEMPE logo. Notice this model has red seconds markers. There were many people who wanted Patek Philippe to reintroduce the absolutely timeless triple-date for a long time, and the closest Patek Philippe came was by introducing the Reference 5125 as shown below. The challenge was that Patek Philippe made this watch for Wempe, which is was, at the time a German Patek Philippe Authorized dealer and jeweler who had been selling Patek Philippe many years. 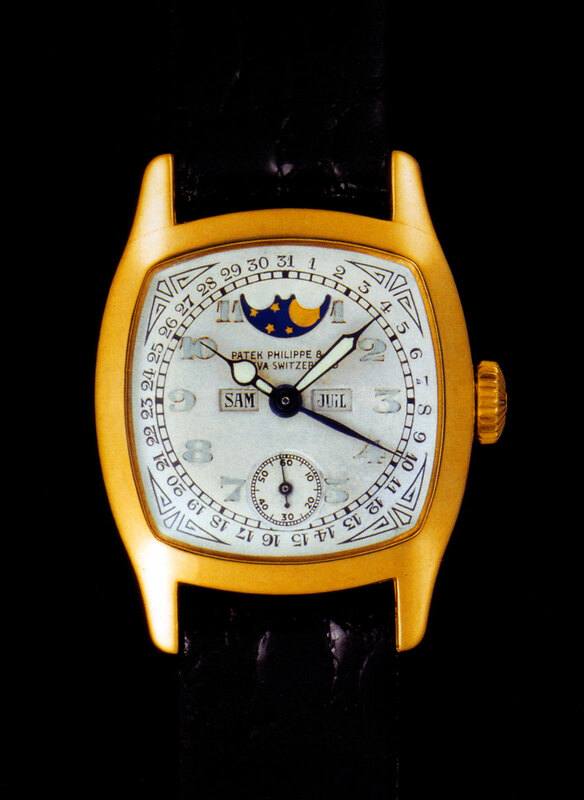 In 2003 Patek Philippe made this watch to celebrate the 125th anniversary of Wempe Jewelers. The Patek Philippe Wempe Reference was limited to 125 pieces. In 2010 Patek Philippe finally brought back the triple-date model as the all-new Reference 5396. In 1878, with a mere 80 Marks in pocket, the young watchmaker Gerhard D. Wempe opened a watch and jewelry business in his Aunt Caroline's house in the small German town of Elsfelth, just outside the northern city of Bremen. Business went well for the young entrepreneur and in the years to come he moved his venture to Oldenburg and later to Hamburg, where in 1907, he established the company's "Stammhaus" or "flagship store". By 1914 Wempe had opened 4 more stores in Hamburg. However, with World War I sales dropped considerably. 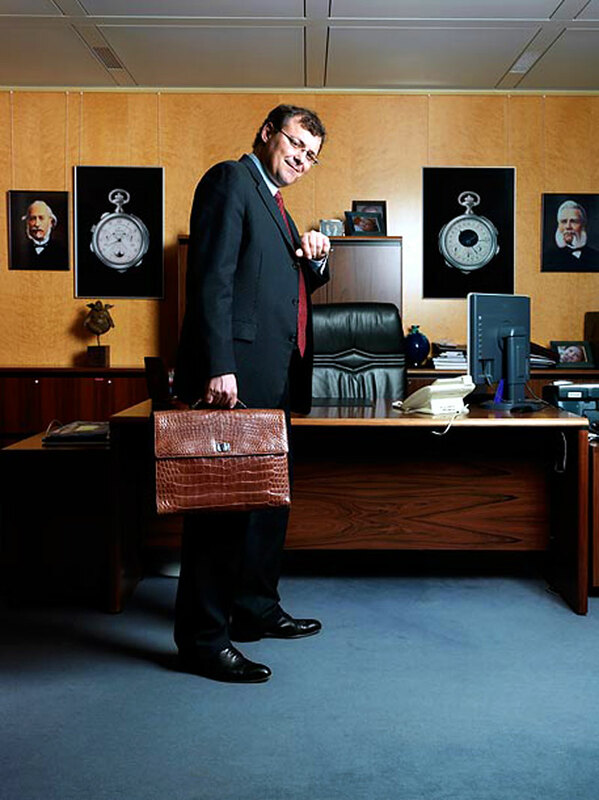 When Gerhard D. Wempe died in 1921, his son Herbert took over the business concentrating on exclusive connections to Swiss watch brands such as Omega and Longines. He further extended the business, buying in 1938 the famous "Hamburger Chronometerwerke" factory, an important manufacturer of ship's chronometers known for producing high precision nautical instruments. World War II again brought personal and professional difficulties. During this time, several stores were destroyed and 80% of the workforce was without housing. In 1945 the company management was handed over to a trustee, and in 1951, the 19 year old son Hellmut had to take over the business. By 1953 Wempe again had 5 stores in Hamburg and by 1960s had opened additional stores in several other German cities. In 1980, Wempe entered the international scene with the opening of its US flagship store on New York's Fifth Avenue. Stores were also opened in Paris, Vienna, London and Madrid. 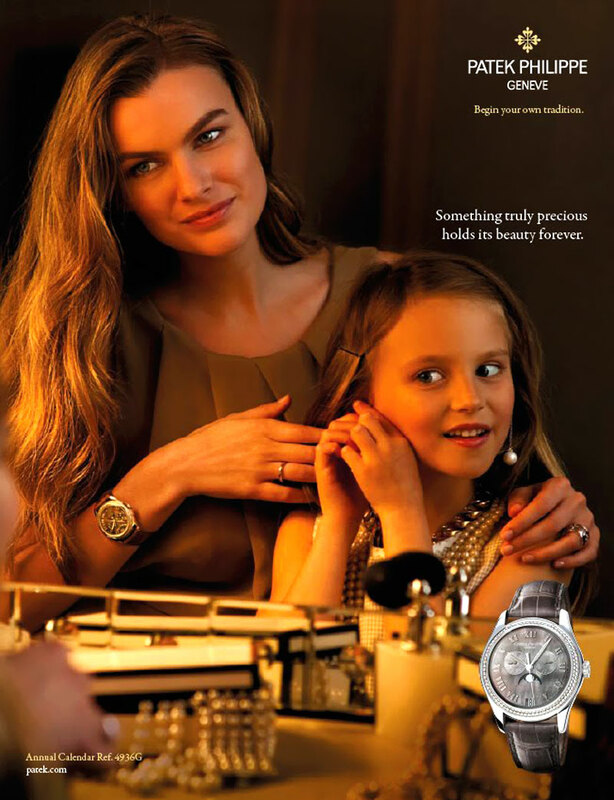 Since 2003 daughter Kim-Eva Wempe, who joined the firm in 1987, officially heads Germany's most respected watch and jewelry retailer. Today, Wempe has over 500 employees and 26 branches worldwide and additionally operates in Hamburg the largest watch repair and service facility of any retailer in Europe. 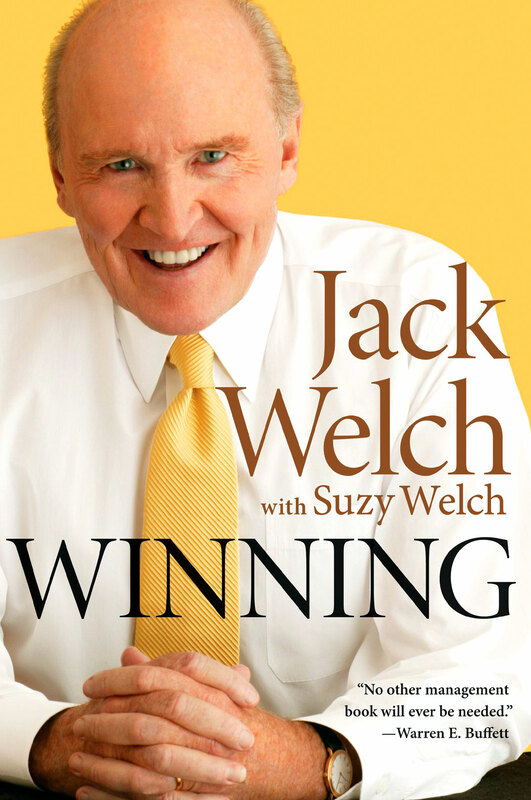 Jack Welch is considered to be one of the most successful business leaders in the world. 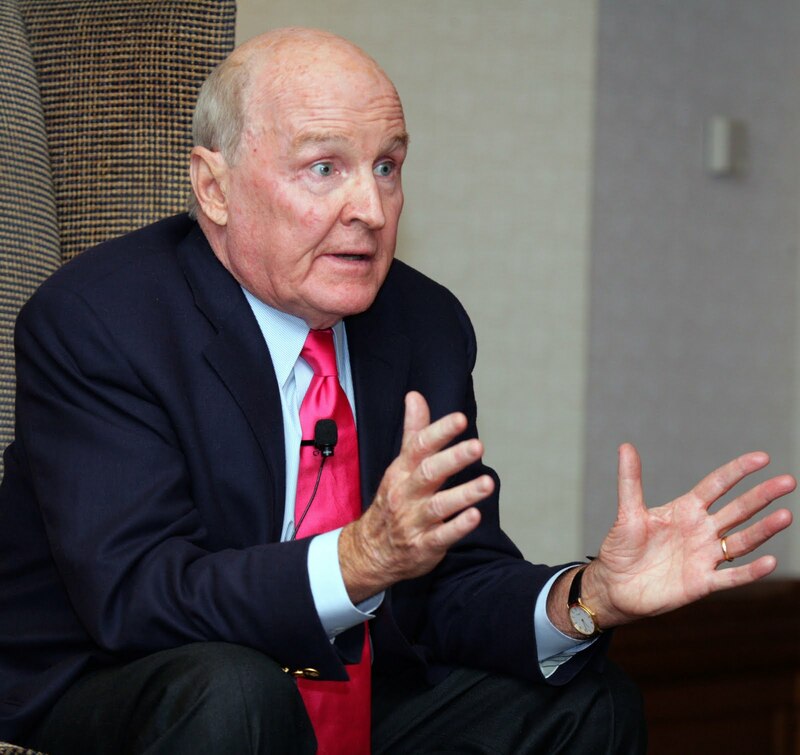 He began his career as a chemical engineer and went on to become the Chairman and CEO of General Electric from 1981 to 2001. 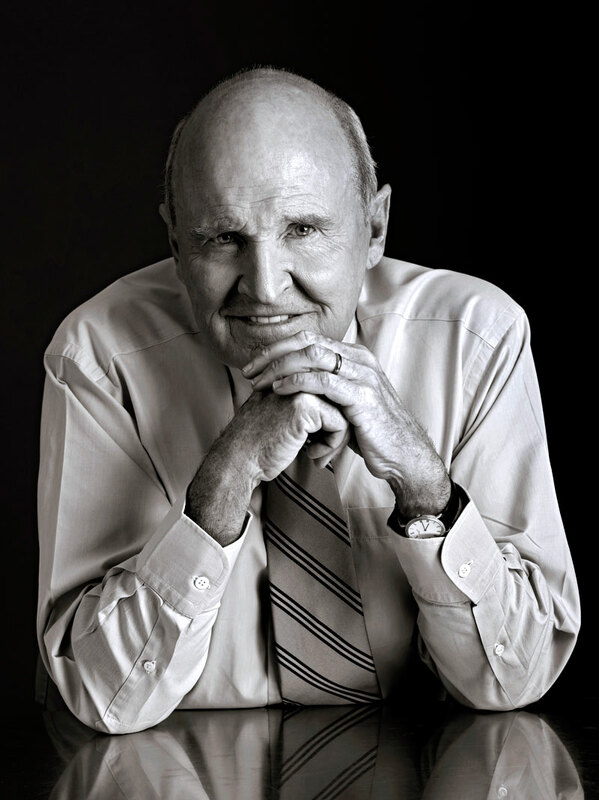 Jack Welch is seen in all the photos in this article sporting his trademark Patek Philippe Calatrava [Reference 5120J] in yellow gold. 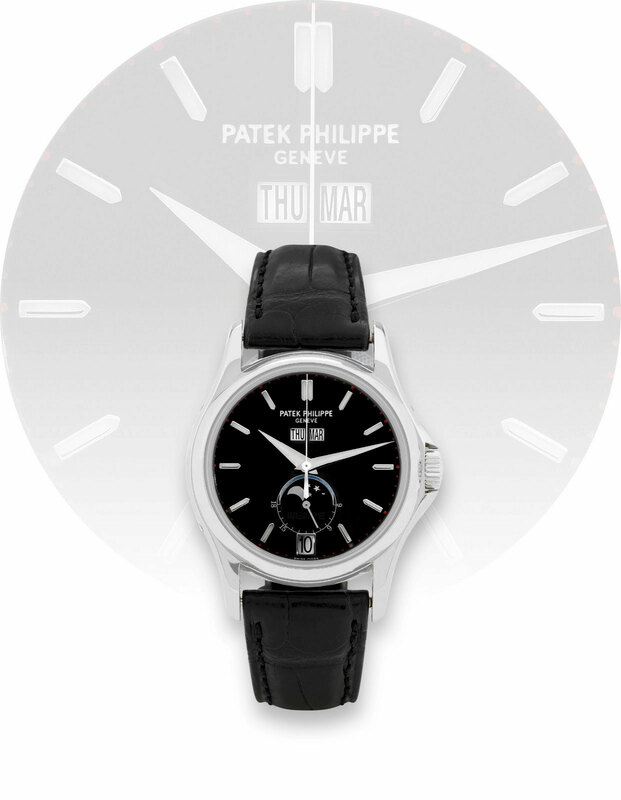 The Patek Philippe Calatrava [Reference 5120J] is considered to be the ultimate gentleman's watch. There are basically three levels of Patek Philippe dress watches. The first classification would be the Patek Philippe Calatrava models which are renowned for their absolute simplicity and minimalism. The second class of Patek Philippe dress watches are complicated watches, and the third and most typically expensive class of Patek Philippe dress watch are know as Grand Complications. 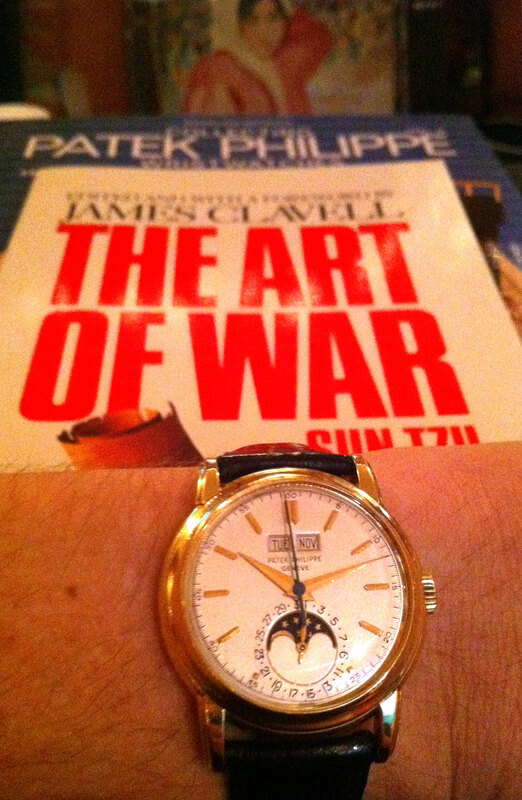 Jack Welch's Patek is a very simple, understated Calatrava. 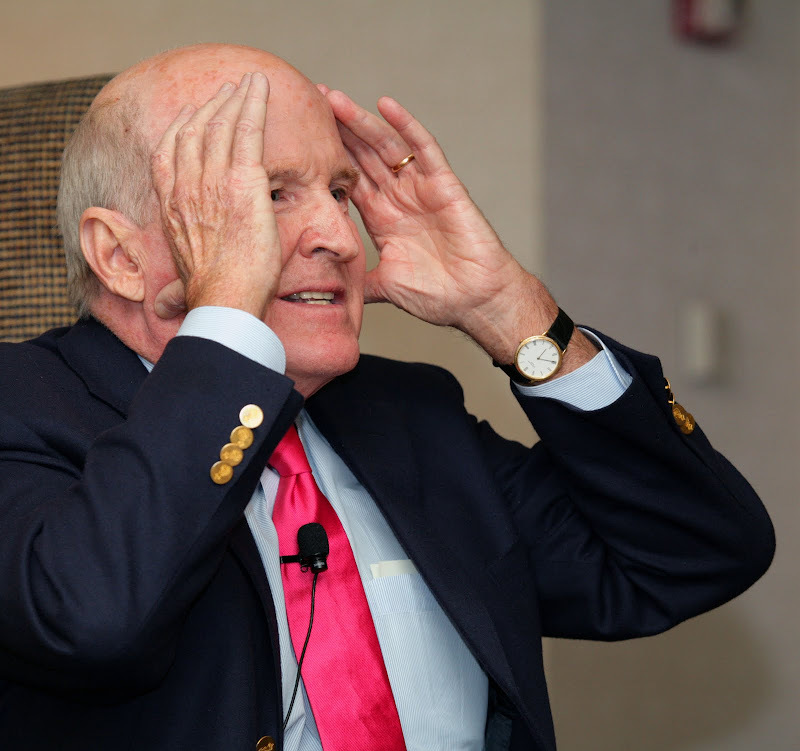 In this next photo below, we get a close up wrist shot of the photo above and we get positive confirmation that indeed, Jack Welch is wearing a Patek Philippe Calatrava [Reference 5120J] in yellow gold with the hobnail bezel. 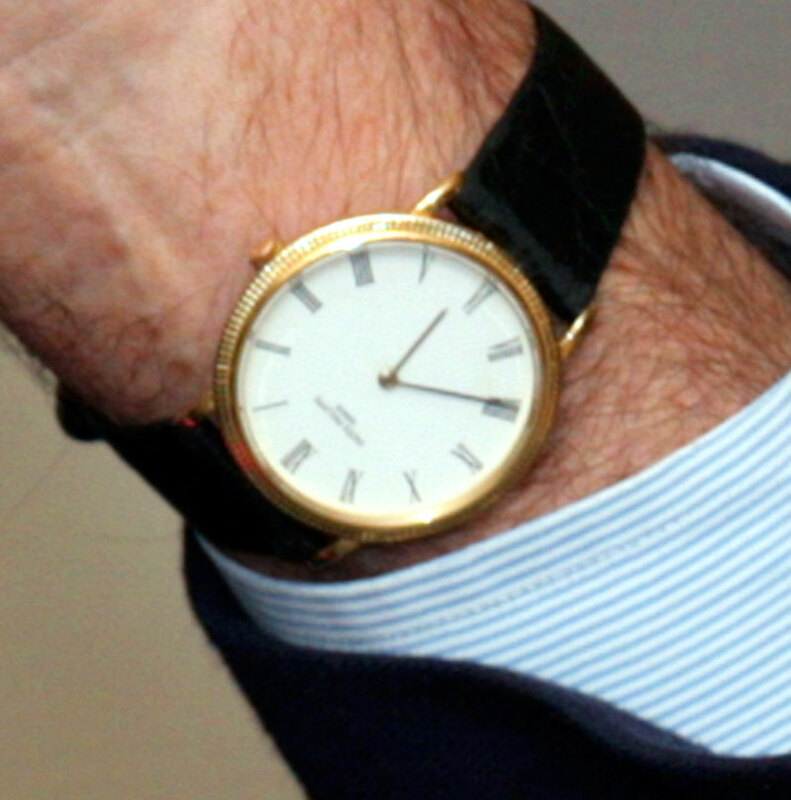 The next photo shows the same model of Patek Philippe Calatrava [Reference 5120J] in yellow gold, that Jack Welch wears. Patek Philippe has been making this watch for many decades, and if you look closely you notice the bezel has two rows of small pyramids that run concentrically around the bezel. This type of bezel is commonly referred to in Patek Philippe parlance as a hobnail bezel. 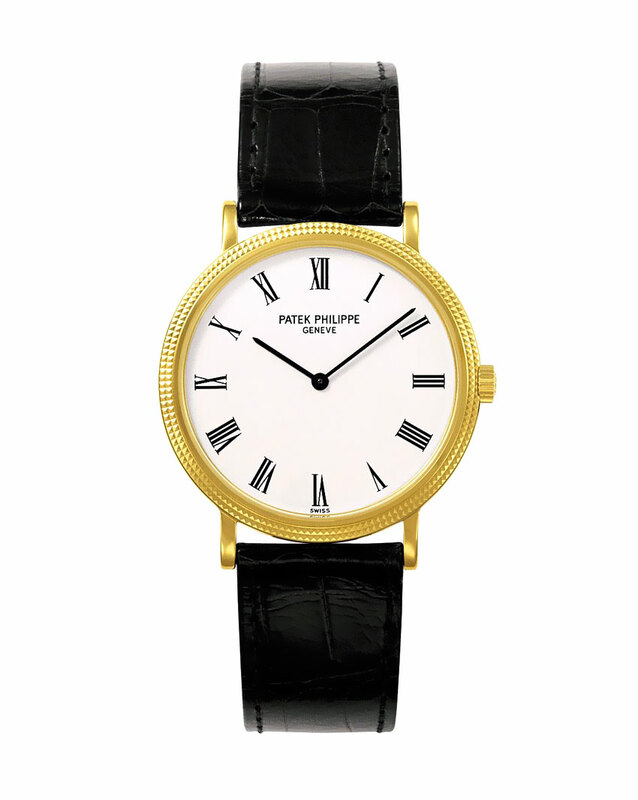 The Patek Philippe Reference 96 Calatrava from 1942 is pictured below in Pink Gold. 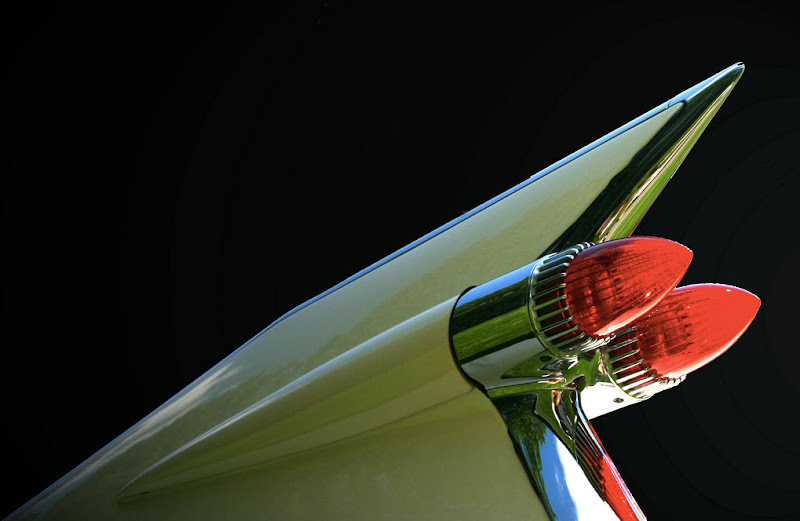 The modern, Art-Deco Reference 96 is characterized by its clean lines. I have always liked the very simple Patek Philippe Calatrava watches, but I tend to gravitate more toward the Patek Philippe Grand Complications. That being said, there is no question, that the Calatrava models are minimalist masterpieces. This next image shows a 1937 Patek Philippe Reference 96 Calatrava along with its Official Patek Philippe Archive Extract. Patek Philippe is unlike any other brand in the world, in the sense that it has a supreme appreciation for its history and heritage. Patek Philippe is so serious about authenticity, they offer a service where you can send them any Patek Philippe watch, and for a fee, they will go though their meticulous archives and pull up the extract on your watch. After they have done so, they will issue an "Extract from the Archives" document as seen below, which documents all the details of your Patek Phillipe. 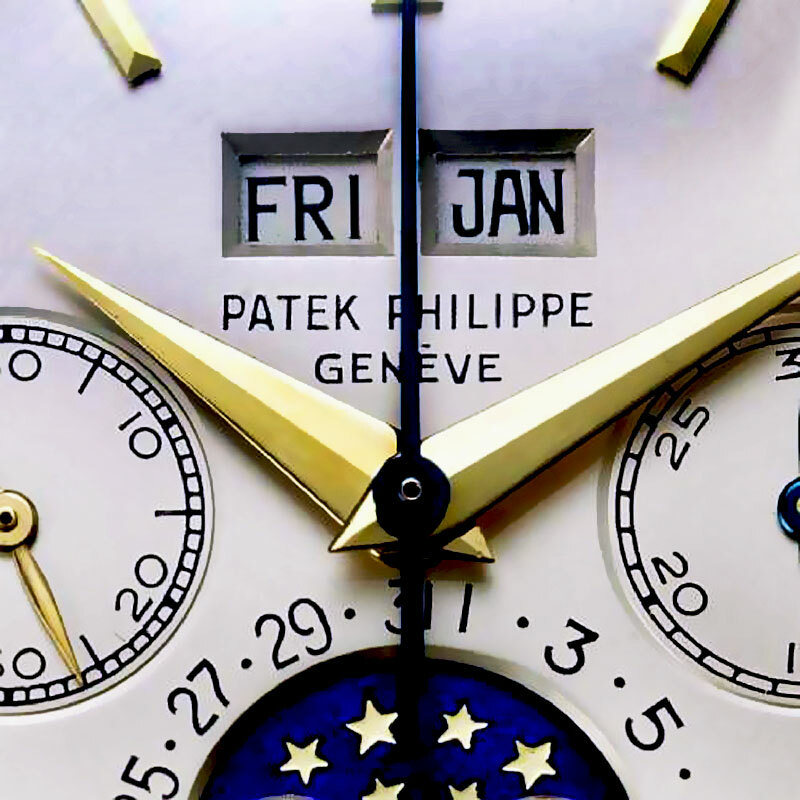 This is just one of the details that differentiates Patek Philippe from everybody else. Historical Note: In the image above (1937) the dial designation reads "Patek, Philippe & Co" and the newer one (1944) a the top of this post reads "Patek Philippe & Co" so the difference, is the later manufactured version removes the comma after Patek. 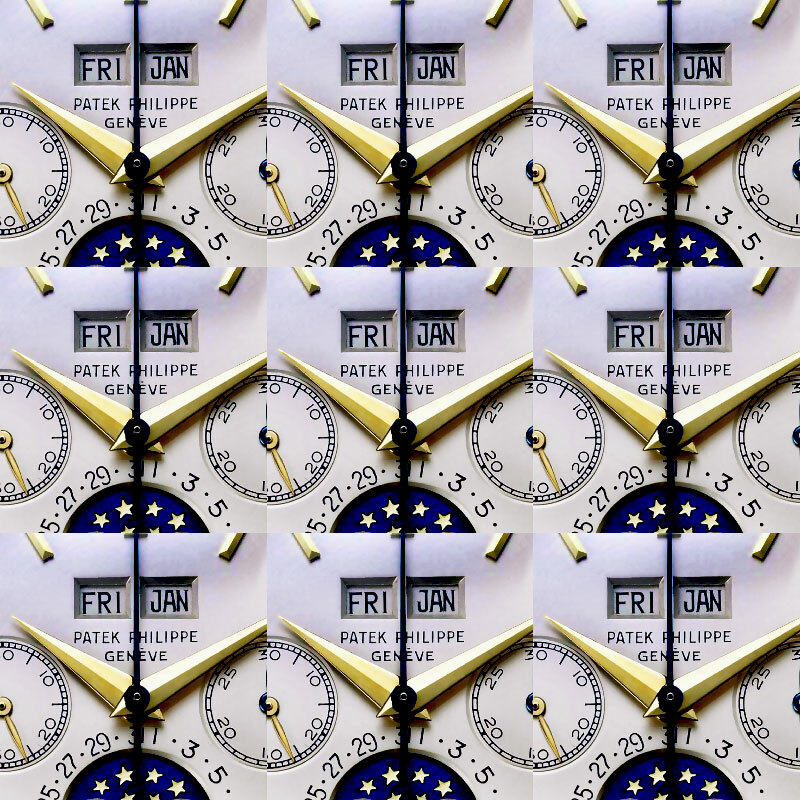 Today the dials simple read "Patek Philippe." If you are a regular reader of Jake's Patek Philippe World you have probably noticed my favorite Patek Philippe design language typically is found in the Grand Complications and particularly anything with a Moonphase indicator and Dauphine hands. I just love this stunning, timeless Art Deco design language!!! 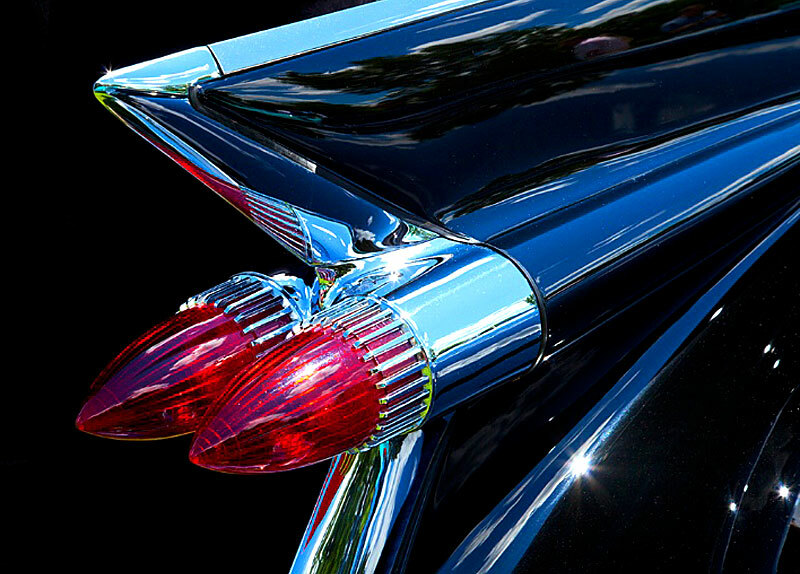 To be specific, the design language in the Patek Philippe Reference 2499, pictured above is similar to the late Art-Deco design language seen in the photo below of the 1959 Cadillac tail fin. 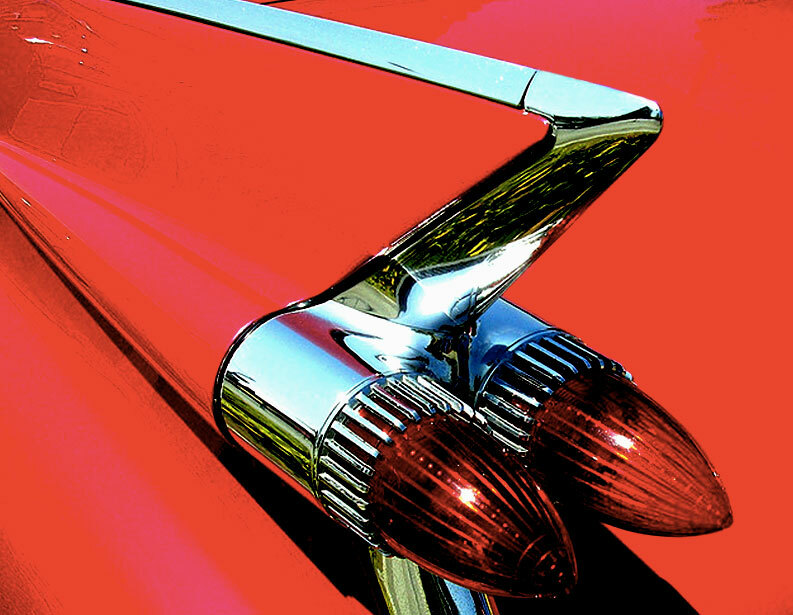 This style of Art-Deco from the late 1950s is referred to as Populuxe. Populuxe is defined by very-clean, sharp, pointy lines–coupled with precise geometry which results in a Space-Age, futuristic stream-lined modern look which is optimistic and powerful. The Patek Philippe Reference 2499 and the 1959 Cadillac tail fins are both simple yet complex, and unequivocal. That's the word I am looking for: Unequivocal. I was playing with the image above in Photoshop, and I came up with the tiled image below which I think looks neat ;-) High Art Jack, High Art!!! 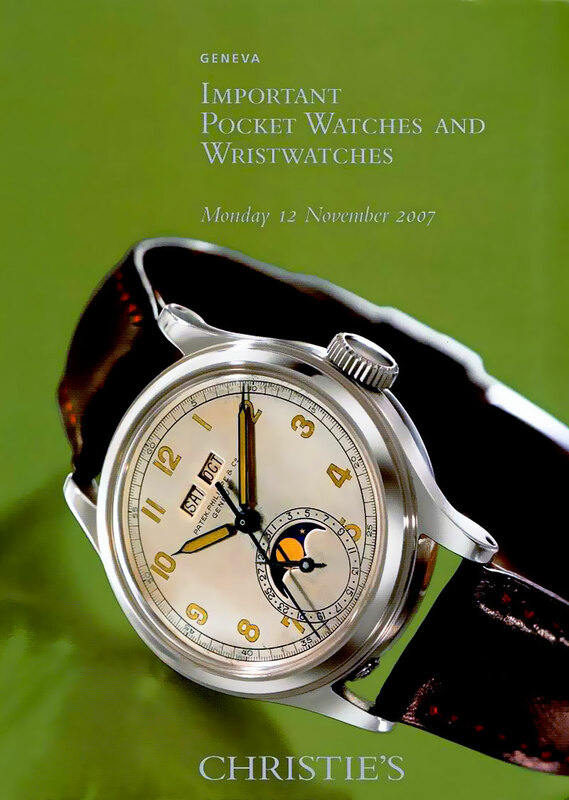 This is a beautiful and unique Patek Philippe Reference 1591 pictured on the cover of the Christie's Geneva Important Pocket Watches and Wrist Watches from November 12, 2007. 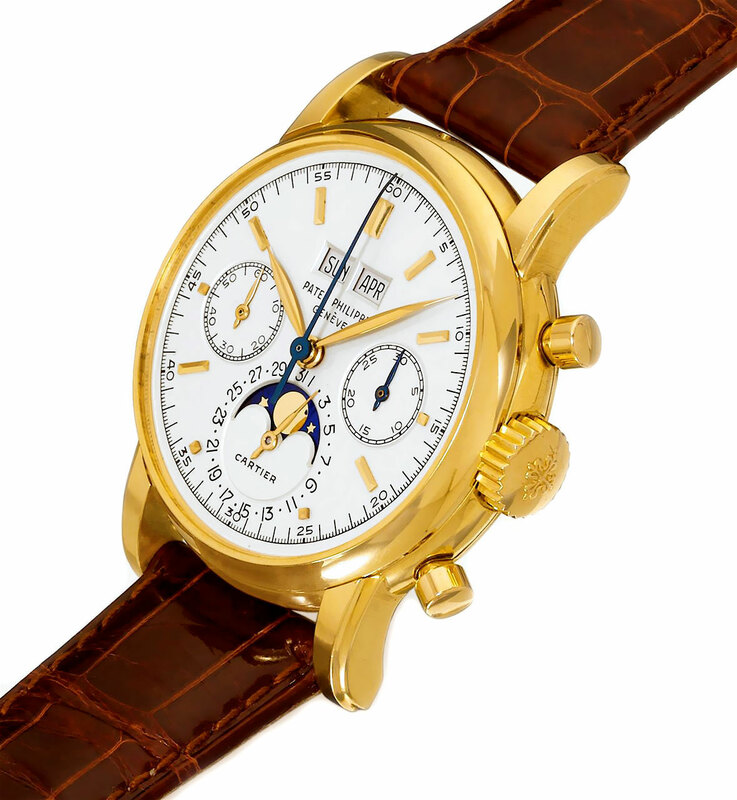 This one-of-a-kind stainless steel 1944 Patek Philippe Reference 1591 sold for $2,240,714. 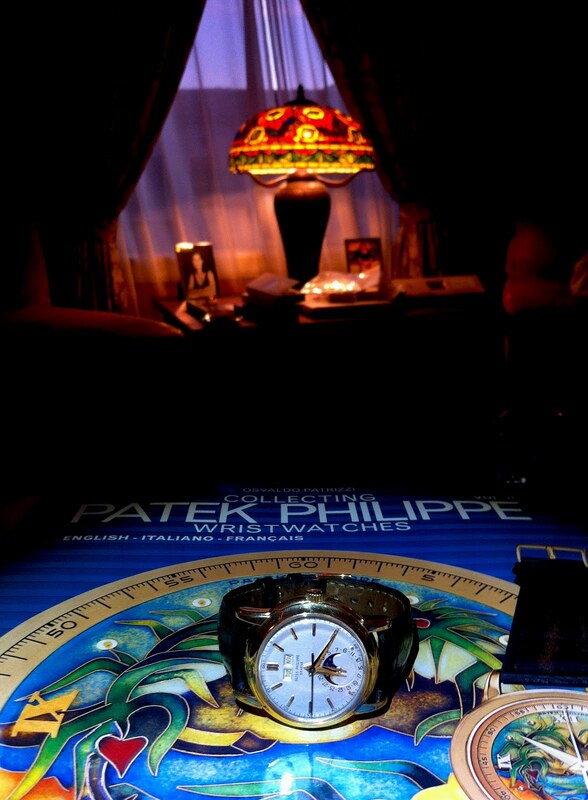 John Goldberger sent in the next images of the Patek Philippe Reference 1591 which is showcased in his amazing book named Stainless Steel Patek Philippe's. This unique watch is now on permanent display in Geneva in the Patek Philippe Museum. 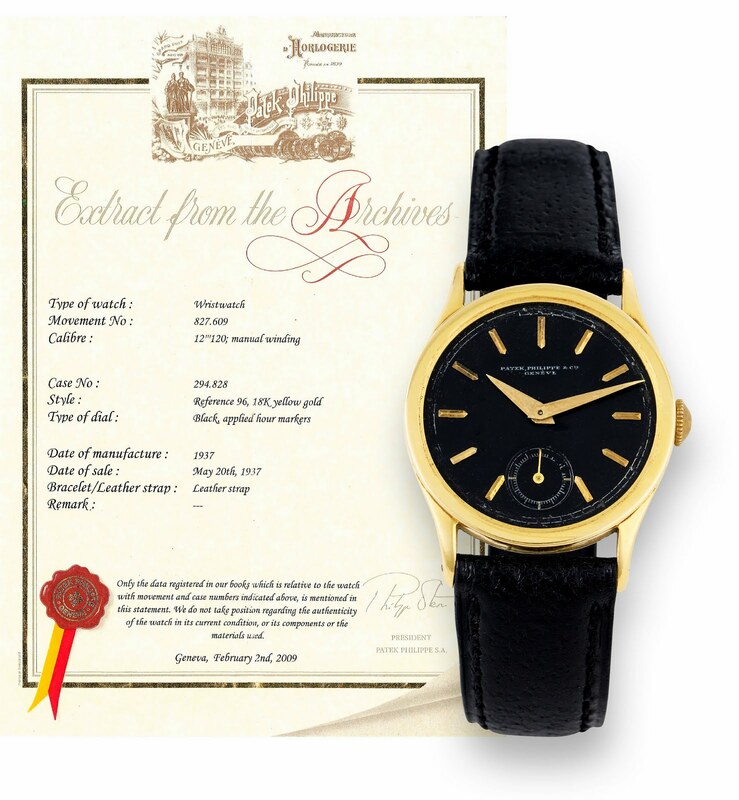 Ironically, even though the image above is from the Christie's 2007 Auction Catalog, the photo below is of the exact same watch from a 2002 Antiquorum Auction House catalog. 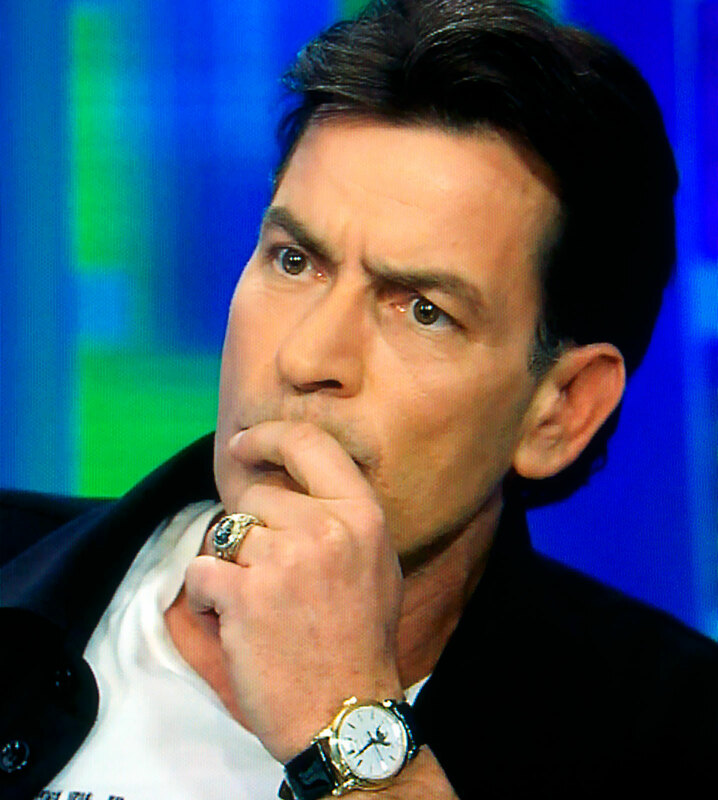 Charlie Sheen is pictured below wearing the exact watch in the photo above. Just to be clear, this is not only the same model, but the ACTUAL Patek Philippe Charlie Sheen Owned. So why doesn't Charlie Sheen own this watch any more? Because he recently upgraded to an over-the-top Patek Philippe Reference 2499 in Pink Gold with Breguet numerals that he paid close to $2.5 Million for!?! The only watch that keeps Warlock time - Class of 1927 ring "Bambino U"
So what does Charlie's cryptic message really mean? Well, his 1927 world championship ring belonged to and was won and worn by Babe Ruth!!!! That is pretty impressive in-and-of-itself, but for a fellow WIS, it is not as impressive as his Patek Philippe wristwatch!!!! Charlie is wearing what is probably the most elegant, timeless watch ever made. 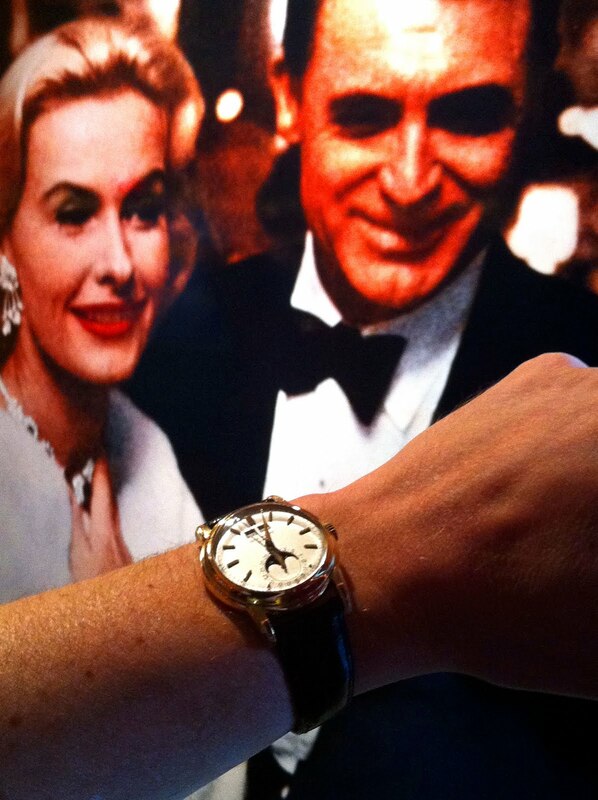 He is sporting an EXTREMELY RARE Yellow gold Patek Philippe 2438J, Complicated Moonphase that was made in the late 1959. Of course, I couldn't stop taking photos of this amazing Patek Philippe model. After all Patek Philippe only ever made 179 of this stunningly elegant reference. 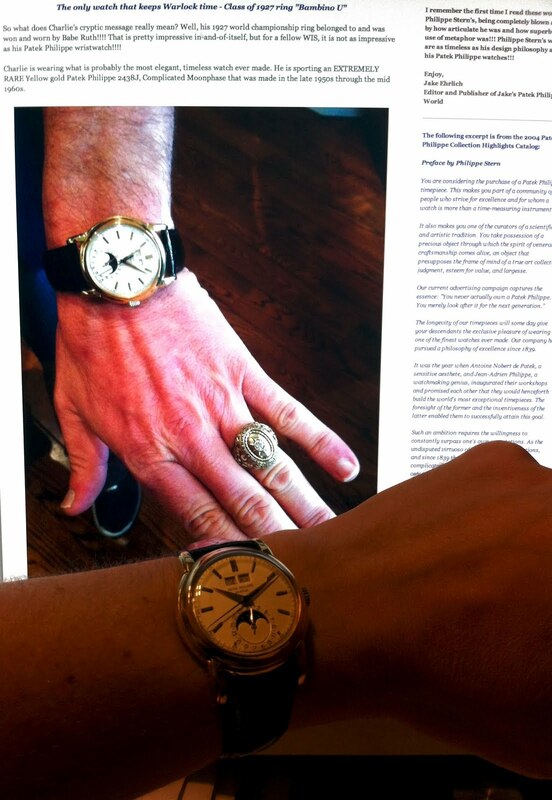 In the photo below, I am wearing Charlie Sheen's Patek Philippe Reference on my wrist, which I am holding up in-front of my original blog post on Jake's Patek Philippe World about Charlie Sheen's Patek Philippe, which is pictured above. One of the coolest things about being a watch historian for Patek Philippe and Rolex, is from time to time, I get to wear some watches that belong to really famous people, so as you can imaging I was in awe of sporting this famous Warlock Watch. In the past I have also worn Steve McQueen's personal Rolex Submariner [Reference 5512] which was really cool!!! Just for the record, over the years I had been publishing Jake's Rolex World, I kept thinking in the back of my mind, I should create Jake's Patek Philippe World. 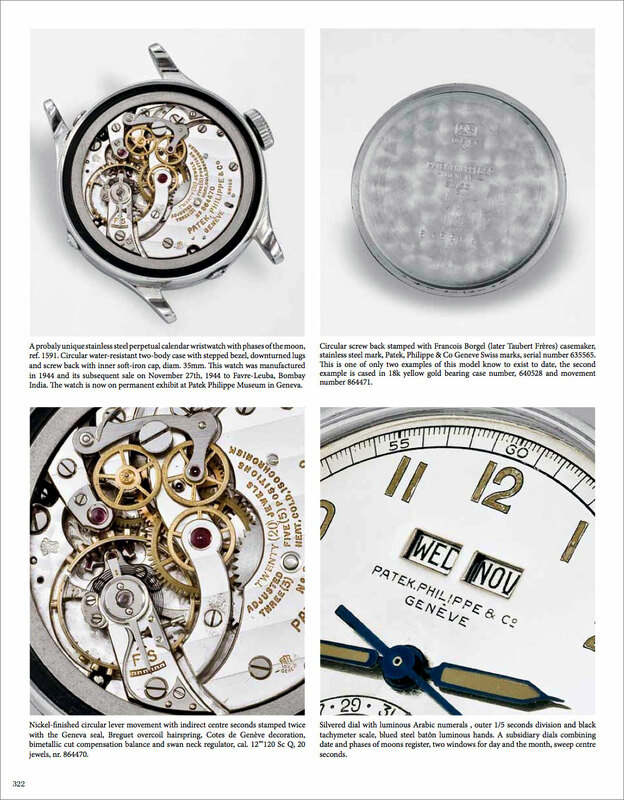 The reason being that I have always liked Patek Philippe as much as Rolex–despite the fact they are both so different. In many ways Patek Phillipe and Rolex represent the opposite sides of the same coin. What Patek Philippe is to dress watches, Rolex is to sport watches. One could also argue that if Patek Philppe is the Rolls Royce of watches, then Rolex is the Mercedes Benz. Back in March or 2011, when Charlie Sheen went through the whole "Winning" fiasco, when he left 2 and a half men, I noticed he was wearing the Patek Philippe Reference 2438 that is pictured on his wrist in the photos at the beginning of this story. 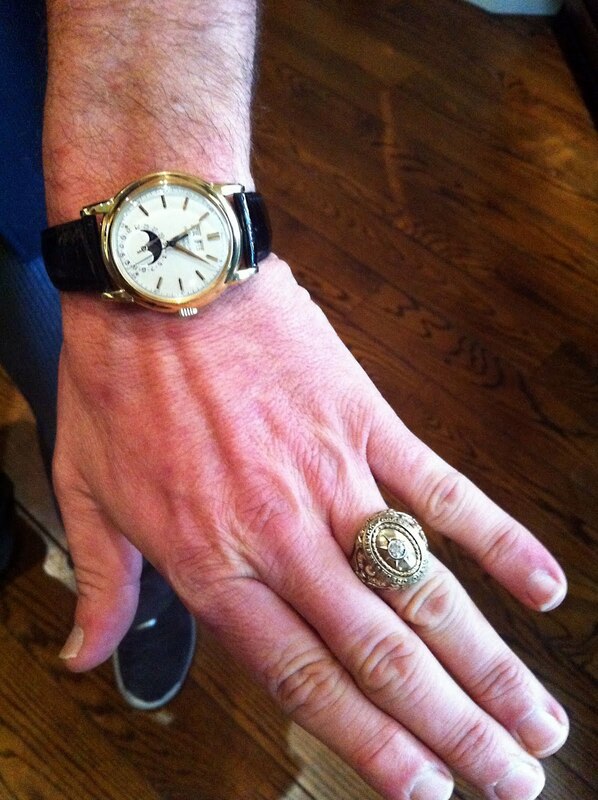 I have to tell you I was shocked to see this crazy-cool stunningly amazing Patek Philippe on Charlie Sheen's wrist!?! Why was I so shocked? Because I have NEVER seen a Reference 2438 on anybody's wrist in my life!!! Of course I recognized the Charlie Sheen's watch right away, and as I just mentioned I was shocked to see a Patek Philippe on anybody's wrist because nobody actually wears these watches because they are so expensive. 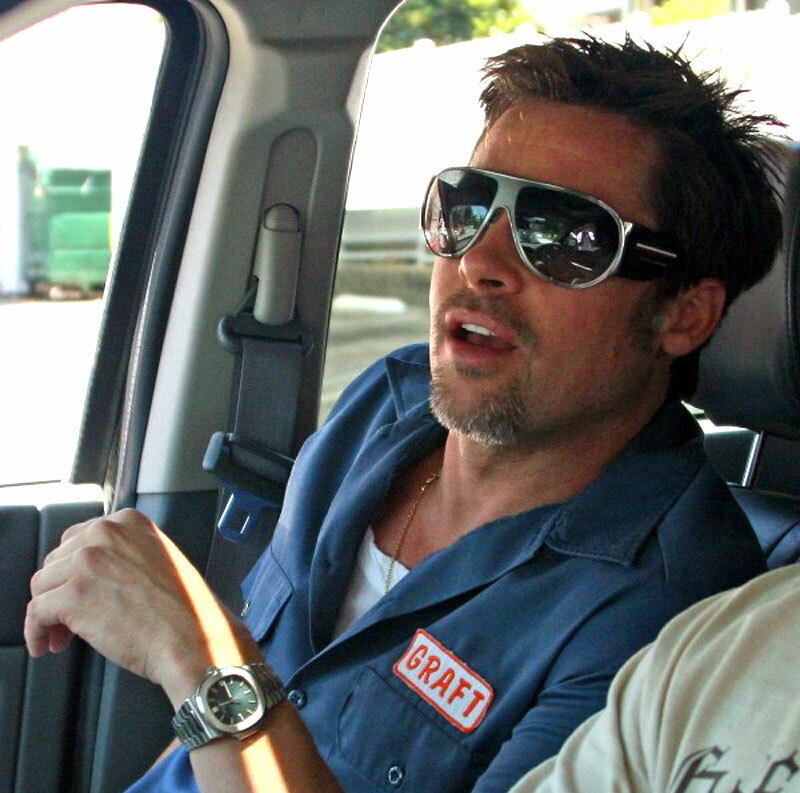 We are talking about a watch, that is the size of a quarter, that costs a half-million dollars. I was not impressed with how much Charlie Sheen's watch was worth, I was stunned with how beautiful the watch was and is. 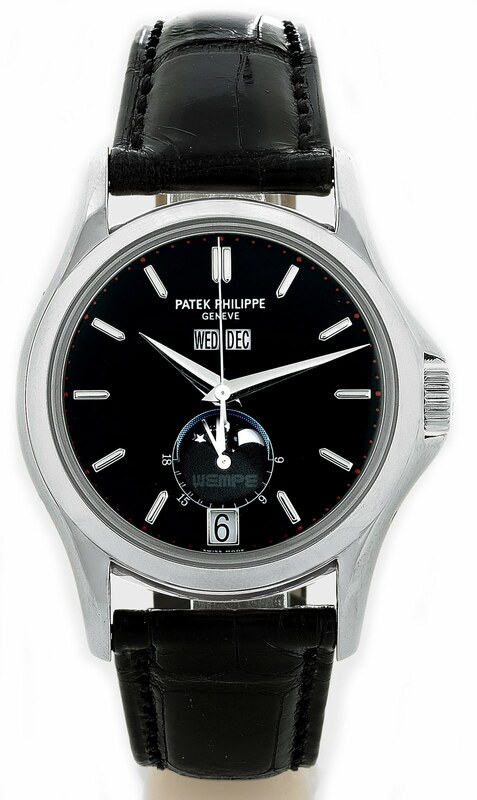 In my opinion, the Patek Philippe Reference 2438 is one of the best looking dress watches ever made. I love how simple the user interface is on the Patek Philippe Reference 2438. It tells you everything you need to know at a glance, and nothing more. It it hyper-simple, yet hyper elegant. I was so excited to see the watch on Charlie Sheen, that I wrote an article about it on Jake's Rolex World. 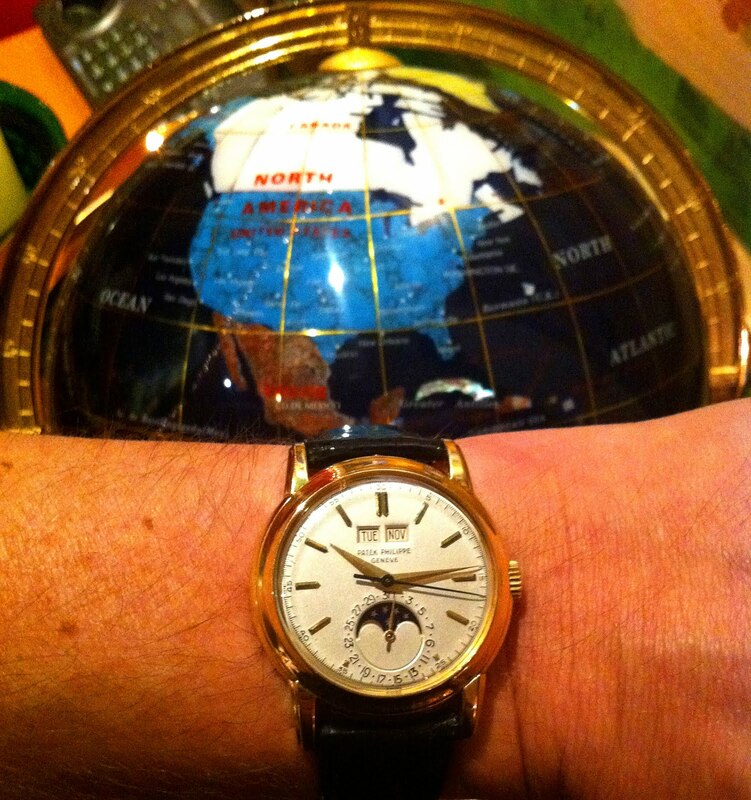 Then, for some reason, I realized I just had to finally create Jake's Patek Philippe World!!! So my very first post on Jake's Patek Philippe World was about Charlie Sheen's Patek Philippe Reference 2438. 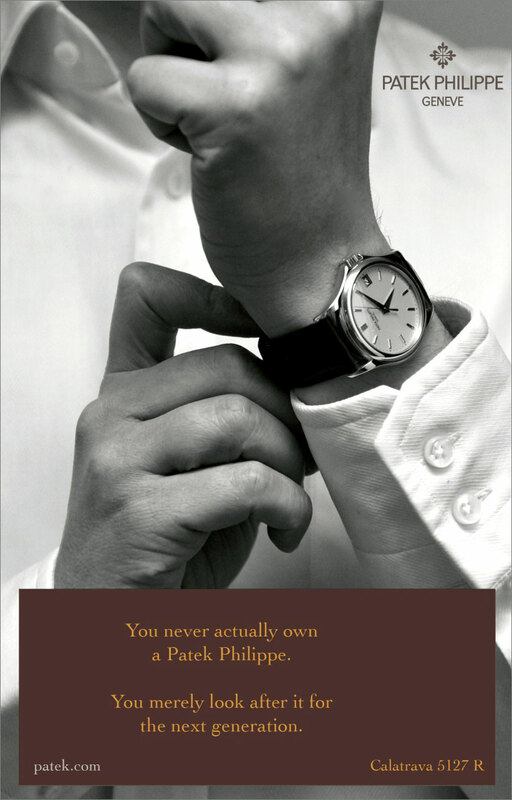 Of course I had been thinking about starting Jake's Patek Philippe World for a long time. In a conversation with my pal Milos, several months before I started Jake's Patek Philippe World, I mentioned I was thinking about doing so, and ironically it was seeing Charlie Sheen's Patek Philippe that pushed me over the edge.